When you embark on a mission (like I have) to declutter and re-organise your belongings, you’ll find all sorts of things. I know I have. And broadly speaking, you can group all this ‘stuff’ in a small number of categories, each with their own type of things in them and their own set of challenges. So here’s a list of things you can find when decluttering. Let’s start with the things you’re ready to part from. These are the easy things. The ones you can bin straight away and bank on that feeling of achievement for having made a quick decision about something that feels good. What do I mean by these? The clothes with holes in them that you don’t quite know why they’re still in your wardrobe anyway. Or old baby clothes with stains on them that have been sitting there for the last 5 years. Old receipts that you must have kept for a reason but have now faded. Or broken toys that everyone had forgotten about. You get the gist. These are things you can easily bin or put in the recycling without giving them a second thought. And then you can be off celebrating your achievement. A clear example of this for me are my babies’ old cloth nappies. I’m no longer using cloth nappies for any of my children, and I’m not planning on having any more either. So why keep the nappies? Yet, I have a bag full of them, and I’m struggling to part from them. I don’t think I can sell them as they’re not in good enough conditions. But I don’t want to throw them away either, and I’m sure I could easily find someone to donate them to. I’m blatantly procrastinating here. But I’m just not ready to get rid of them (yet). I know I will be. The day will come when I look at the bag, something will snap, and I’ll want them gone ASAP. But that time isn’t here yet. So they have to wait there with the rest of the clutter until I’m ready to tackle them. So maybe you have items that are still in great (used) conditions (clothes, shoes, bags etc. ), and you know you could make some money if you sold them. But what do you do? List them up on a website? Try and sell them at a car boot sale or on social media? These are things you want to let go of NOW, but annoyingly, you have to wait. And wait. And wait. Or maybe you don’t want to sell them. Maybe you want to donate them to charity or give them so someone who needs or wants them, except you won’t see that person for another month or so. These are the things that generally frustrate me. I could be ignoring something for months – years even. But the minute I decide it needs to go, it needs to go. NOW. But what about the things you’re definitely not ready to part from? These are the things you use and like. The things that, in Mari Kondo’s terms, ‘spark joy’. You want these items to be easily accessible and not piled under all the other (often unnecessary or unwanted) stuff. When you open your wardrobe in the morning you want to see the clothes that you like and wear. You don’t want to have to go through layers of mess before you get to it. And this goes for everything else in your home. If you organise things according to your vision – to what you want your life and your home to be and look like – you’ll only surround yourself with the things that fit that vision. Not with ‘stuff’ that’s just going to confuse and distract you. For me, these are your non-negotiables. You may not even use these. They might not fit your vision at all – not even remotely. But you keep them nonetheless. Like the little flowery purse that my Grandmother bought me on holidays when I was a child. I must have been 8 or 9 max. I haven’t used that purse in years. But I won’t get rid of it – even if it’s taking up space for no reason. Mind you, I do question myself over sentimental items sometimes. Like the top I wore at my graduation party that I remember shopping for ages for with my Mum. Of course, it doesn’t even fit me anymore! So what do you do? Do you ‘brave it out’ and give these things away? Will you regret it later? One suggestion I picked up the book Scaling Down by Judi Culberston and Marj Decker, is to keep a photo of the item instead of the item itself. But does this work for everything? Do you or would you do this? This is by far the most frustrating group for me. It includes a vast and random amount of stuff. The 5 (empty) flower vases I have on top of the kitchen (why do I have 5, and why do I have to keep them all?) The big pot you can cook for 12 people in (that I’ve used probably twice in the last 10 years). But also, all the bits and pieces of clutter that the house seems to produce! Screws that have come out of something, spare buttons, curtain hooks, wires, spare or odd-looking parts that you’re sure belong somewhere (maybe even somewhere important), but you just don’t know where. And most importantly, where does all this stuff go?! Honestly, sometimes I’d love to just be able to grab a black bag and throw them all away. It’d make me extremely happy not to see them again. But… these are things you keep for the ‘just in case’ – for the day you will need them. For the day when you go: “Aaaah! That’s what THAT was for!” But where exactly do you put all this stuff?? I’m considering creating a ‘box of mess’ and hiding it somewhere. Maybe in the garage. Any better ideas? These are not even sentimental items as such, but they are maybe things that were given to you by someone – maybe a family member. Things you feel you should keep as keepsakes maybe? For example, I’ve been holding on to all my babies’ first shoes – not just the ones they first walked in, but the actual baby shoes that you can put on when your babies are tiny and not even remotely close to being able to walk! You know, the ones that fall off their feet when they kick in the pushchair every 5 minutes? Somehow I feel like I should keep them for my children, and one day proudly produce a precious box from the loft and say: “These were yours”. Should I though? Will they even care? In the meantime, I’m holding on to them until I make up my mind as to what I should do. For now I just feel bad getting rid of them. Maybe one day something will snap, and I’ll what them gone (NOW), and they’ll end up in group 1! Do you have things like these at home? What about you? 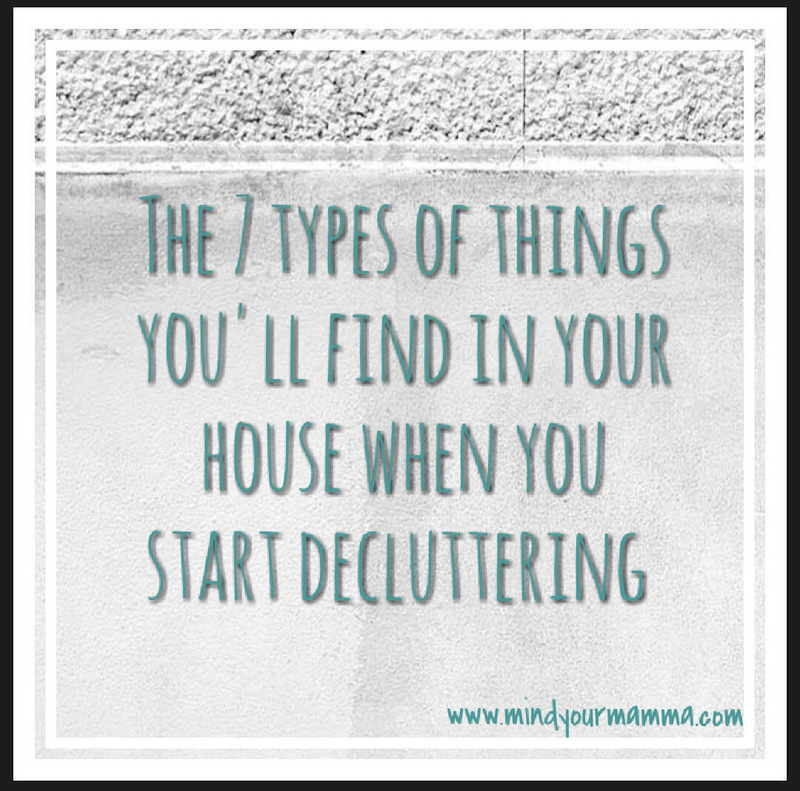 Have you come across other types of things when decluttering? Do you have any tips to share? I’m just starting to declutter at the moment and finding it so hard! My nemesis is paperwork – we don’t really have a big enough file for all the bills and statements we get (despite going paperless as much as possible) and then there are letters from school, medical stuff, leaflets from the health visitor that you might just need one day … Argh, it drives me mad! Tell me about it! My husband seems to be unable to go paperless! He doesn’t deal with the paperwork or admin either! So it’s just piling up and stressing me out! It’s a never-ending process! Aaargh!